The banded hare wallaby is nocturnal. Its diet consists of grasses, spinifex, fruit and a variety of shrubs and other plants. It seems to obtain the moisture it requires from the dew and water that is contained in its vegetarian diet. The animal's island habitat includes dense, thorny Acacia scrub under which it forms runways that it uses for shelter during the day. Other low-spreading shrubs and bushes may also be used. Unlike other hare wallabies this one is sociable, often congregating under bushes during the day and emerging at night to feed. The banded hare wallaby was once common over the semi-arid regions of southern Western Australia. It was probably extinct on the Australian mainland by 1963 (It had not been recorded there since 1906.). At that time it was known to occur on Bernier and Dorre Islands in Shark Bay, Western Australia, where it remains to the present. Attempts have been made to reintroduce it on Dirk Hartog Island. The disappearance of the banded hare wallaby may have been associated with the clearing of vegetation for agriculture, competition for food with introduced rabbits and livestock, and predation by introduced cats and foxes (although its extinction on the mainland may have occurred before arrival of the fox in Western Australia). *** It is referred to as a "hare" wallaby because of its hare-like speed and its jumping ability. The banded hare wallaby was once common over the semi-arid regions of southern Western Australia. Fossils and a single specimen collected in South Australia last century show that it once extended across the southern Nullabor Plain into the lower Murray River region of South Australia. It also occurred on Dirk Hartog, Bernier and Dorre Islands, Shark Bay. After the granting of a pastoral lease on Dirk Hartog Island in 1899, it gradually declined and finally disappeared from the island in the 1920's. It was probably extinct on the Australian mainland by 1963 (It had not been recorded there since 1906.). At that time it was known to occur on Bernier and Dorre Islands in Shark Bay, Western Australia, where it remains to the present. Attempts have been made to reintroduce it on Dirk Hartog Island. The banded hare wallaby's weight ranges from 1.3 - 2.1 kg (2.9 - 4.6 lb), although females occasionally weigh up to 3 kg (6.6 lb) and males occasionally weigh up to 2.5 kg (5.5 lb). On the mainland the banded hare wallaby inhabited prickly thickets on the flats and the edges of swamps. On the islands it lives in thorny Acacia ligulata scrub. The banded hare wallaby is one of the species that live in the Southwest Australia Biodiversity Hotspot (Cons. Intl. 2005) . Although males and females are capable of breeding when they are only a year old, they usually do not breed until their second year. The female banded hare wallaby usually gives birth in the latter half of summer, although those that fail to breed then may still produce young later in the first half of the year. Females may also have an embryo in reserve in case something happens to their young. This leads to the occasional birth as late as September. While females are usually reproductively inactive in October and November, severe summer drought can disrupt this pattern with breeding occurring as soon as the drought is broken. While some female banded hare wallabies may produce 2 young in a year, they usually manage to rear only 1. The young spend about 6 months in the pouch and are weaned at about 9 months. 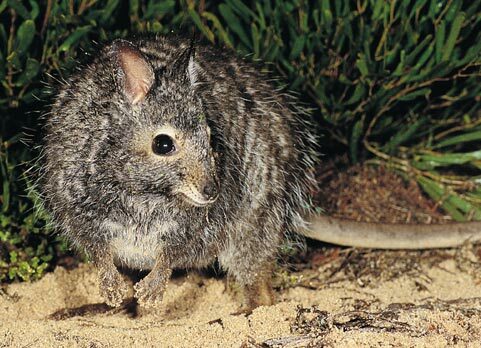 Its diet consists of grasses, spinifex, fruit, and a variety of shrubs and other plants. It seems to obtain the moisture it requires from the dew and water that is contained in its vegetarian diet. Unlike other hare wallabies it is sociable, often congregating under bushes during the day and emerging at night to feed. Although female and juvenile banded hare wallabies maintain largely amicable relations, males exhibit a high degree of aggression towards each other. Fighting seems to occur in competition for food.